Does anyone else have the winter blues? Sometimes it can be hard to focus on your daily routine when you’d way rather be in the water! We’ve compiled a list of some of the best swimming places in the world to help satisfy your aqua craving this season. 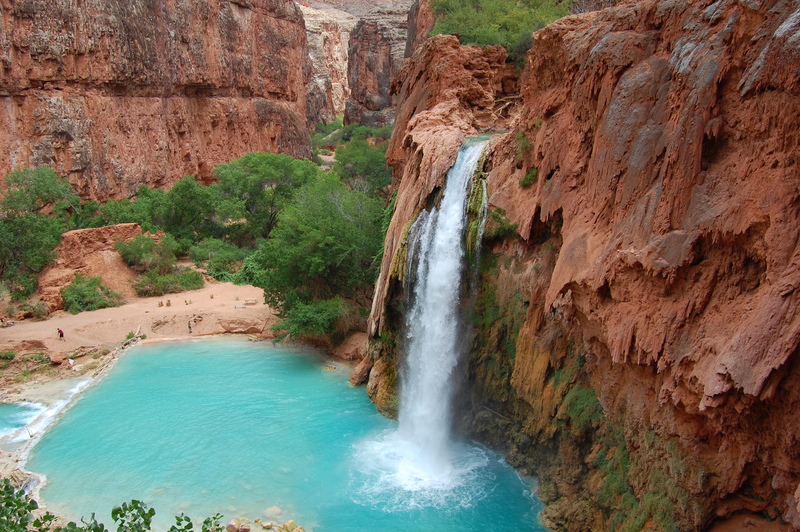 Located just a few hours west of the Grand Canyon and within the Havasupai Indian Reservation, Havasu Falls is a beautiful place to do some leisurely swimming. Havasupai actually means “people of the blue-green waters”. The lake is so blue due to the amount of magnesium and calcium in the waters. The last 8 miles of the trip out to this beautiful swimming hole has no road, so your options are hiking, horseback riding or a helicopter ride. Though it takes a great amount of effort to get there, it is well secluded and the journey will be an adventure itself. There is also camping close to the falls, in case you might want to spend some time there in the canyon! 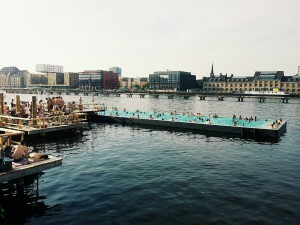 Far from the seclusion of the last spot, Berlin’s Badeschiff is a long, enclosed pool that floats on top of the river. Visitors can swim, purchase food and drinks, and even enjoy yoga sessions on the dock! It does get rather crowded, so lap swimming probably isn’t practical. Regardless, it’s a relaxing place to hang out and float on the river while still having the comfort of a stable platform, clean water, and time to socialize. Beautiful, right? This is actually a spa pool within the Cambrian Hotel in the middle of the Swiss alps! I can’t think of anything more relaxing than taking a dip with this panoramic view of the mountains. Don’t worry about frostbite, though, the pool is heated so you won’t be freezing. The hotel describes itself as a wellness hotel and includes a full suite of spa amenities. I can’t think of a more pampered and relaxing swim than this! 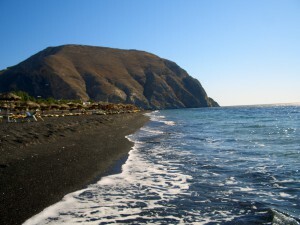 Heading on over to the famous blue waters of the Mediterranean, the black sand beach of Perissa is on one of the gorgeous Greek island of Santorini. The scenery is striking, and the average temperature of the water tends to stay between 60-80 degrees fahrenheit year-round! The beach is also lined with restaurants and bars. They’ll even bring your food out to your complementary umbrella chair! So whether you spend all day here or just come out for a quick dip after dinner, the refreshing, salty sea will be one of the best places you swim. 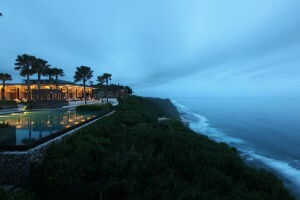 These villas in Bali are incredibly majestic, and they sit on a cliff to overlook the Indian Ocean beneath. Each eco-friendly designed villa comes with an individual saltwater pool, and the resort also has an Olympic-size infinity pool for all guests. The resort itself is pretty pricey, but it’s no wonder when it comes with views like this! For more info, you can access their website here. I hope that hearing about these blue waters helps you treat your own winter blues! If not, you may have to cash in that vacation time and start planning your new trip! 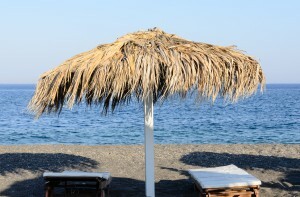 And of course, no swim is the same without your music, so grab a waterproof iPod and some headphones here. Let us know what you think! Where’s your favorite place to swim?